Amazing! David Hales has come about as close to pre-empting my suggestion in the last paragraph of the last Newsletter as it's possible to get! The following article arrived on the last Despatch Date! 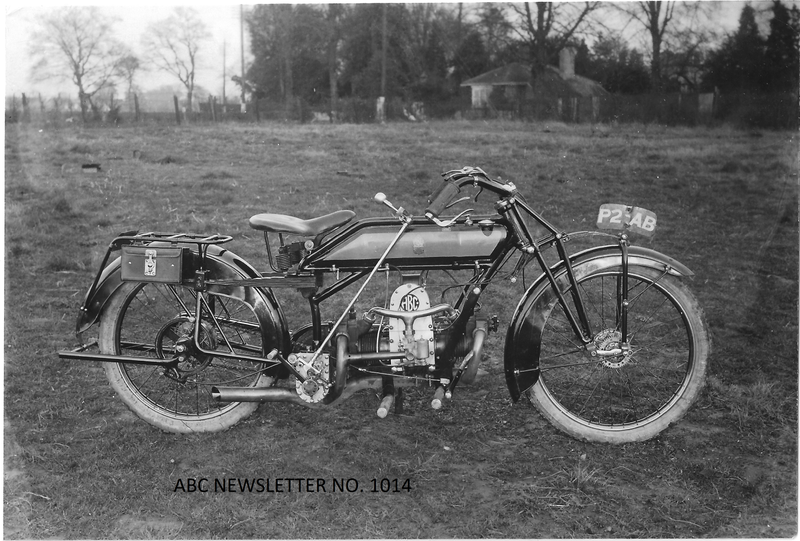 Some little while ago a very interesting photo was included in a Newsletter of a 500cc ABC motorcycle with a French registration number, and the question was posed as to whether the Gnome et Rhone company had any links with ABC for the manufacture of motorcycles prior to the building of the 398cc Sopwith machines. I have therefore been going through the minute books of ABC Road Motors for the period 1914-20 with the following results. 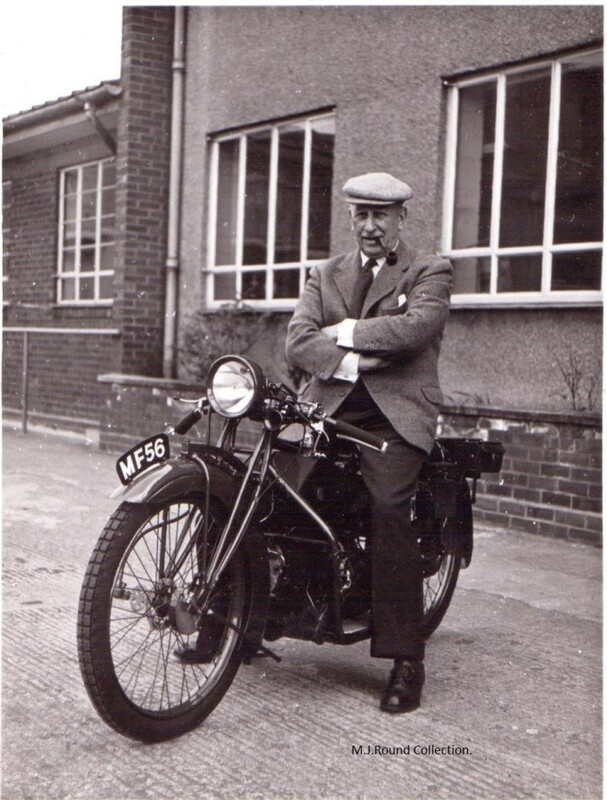 When ABC first started producing motorcycle engines in 1913 their title was The All British Engine Co.Ltd, Brooklands. I have yet to find any photo of a motorcycle fitted with such an engine (would have started at No.750), of which the cylinders might loosely be described as pear-shaped with variably sized diameter radiating fins. Later in the year, the design was modified and a new catalogue produced from The All British (Engine) Co.Ltd, Brooklands, and the cylinder design showed the cooling fins to run parallel to, and at the top end only of the cylinder. Such engines were tried by Douglas, P.V., W E Brough and the like, but it was clear that the ABC claim that their engine would fit most frames was flawed, so they then started producing a complete motorcycle, the earliest examples of which probably did not reach the public until at least March 1914. I have a copy of their 1914 motorcycle engine catalogue originally issued by The All British (Engine) Co.Ltd, but which has a gummed label fixed over that name entitled ABC Road Motors Ltd, Brooklands. At this time the standard ABC motorcycle used an Armstrong 3-speed hub gear, and how many loose engines went anywhere other than into ABC motorcycles is open to question. By the time ABC were starting to produce their complete 500cc motorcycle, they were also thinking they may require larger premises than their shed at Brooklands, and a site in Hersham near Walton-on-Thames was acquired. This required building works and the installation of new machinery but was required more urgently than anticipated when Brooklands was taken over by the military authorities early in August with only 24 hours or so in which businesses could transfer machinery and equipment to alternative locations. It would seem that on the start of proper motorcycle production the company title was again changed to ABC Road Motors (1914) Ltd, and the first board meeting took place on 3rd June that year. At that meeting it was stated that the Commercial & Marine Company (Hanwell) were making 100 engines, expecting the first delivery of a dozen to be in three weeks time, whilst the Brooklands works were setting up to make 100 frames to keep pace with the arrival of the engines. By the 10th June, one motorcycle of the standard pattern was finished, and orders were in for one private buyer, 25 for New South Wales, 8 for New Zealand (one in lieu of a previous order), and 2 for Natal (one in lieu of a previous order). By October 1914 the Armstrong company who were providing the hub gears had gone into liquidation, and Bradshaw was set the task of designing an alternative, which turned out to be a four-speed box, although numerous other modifications also took place at the same time to produce the 1915-pattern machine. The company hoped to receive government orders for their machines, but what was required was large numbers from as few manufacturers as possible, so there seemed little chance that ABC could cope, hence a new direction was taken towards aero and auxiliary engine design, the latter based initially on the 500cc motorcycle engine. By March 1915 a government directive forced companies to funnel their activities solely into war work, so motorcycle production and development became a trickle. In September 1915 the company title was again changed to ABC Motors Ltd.
Production of auxiliary engines in particular kept the factory quite busy, though yet again, much of the work was sub-contracted. Aero engines took on a greater part of experiment and development, and to separate any war office contracts with any other work, another company was formed in August 1917 called Walton Motors Ltd. On 17th December 1917 the Societe Francaise des Moteurs ABC was formed with offices in l’Avenue de l’Opera and a capital of 100,000 francs, with directors of N L Feval, M C Gachet, M P Marachel, and N C Roditi. They had an agreement with Walton Motors, where rights belonging to ABC Motors Ltd and Granville Bradshaw, were acquired with respect to all aero engines and the French patent No.484390 – which I haven’t looked into. There is certainly mention of the big flat twin Gnat aero engine being in France. Come the end of the war, and at a meeting on 27th November 1918, the MD, Capt Ronald Charteris informed the board that he would be leaving the following week for a meeting with the French company with a view to the sale and manufacture and sale of ABC products, and by January 1919 such terms had been agreed. However, by late September 1919 the French company had been reconstructed with the only director of the previous company remaining being N C Roditi. Although Capt Charteris reported that the French company had acted beyond its agreement with Walton Motors, it could not be anything but beneficial to ABC. Of course by that date the prototypes of the 398cc machine were being seen, and the company was making ready for the Olympia Show. My suggestion is therefore, that the machine illustrated in the Newsletter was the one on which Capt Charteris visited France late in 1918, and which would have to be registered there on entering the country in much the same way that visitors to Britain had to register their vehicles with British registrations. The photo enclosed shows one of the 1916/17 type ABCs in which the saddle support tube rises vertically from its base, whereas earlier versions were at an angle. Howard Burrows has called my attention to an excellent documentary on Tom Sopwith: just Google Thomas Sopwith Documentary 1984 - YouTube, and you are in for an interesting and informative 30 minutes-worth! Too bad there's no mention of the motorcycles, but ABC gets a mention or two. The 'Shuttleworth' photo in Newsletter No. 1012 was a blast from the past for Martyn! He remembers that he and the family went to this event (in a small convoy, and with minor complications on the way): in particular, he draws attention to the radiator and open bonnet of the ABC car on the extreme left of the photo, which he is fairly sure is his Dad's! He also contributed the next photo, of Mr. B.W.Hinds, on MF! He had evidently made an attempt (before 'Shuttleworth'), to give MF its correct "grey-black crackle finish", but was told at the event that it was too light. We now have a Brooklands Connection! New Member Ian has won the job of recommissioning the Museum's own Sopwith machine. This is not, I think, a task for the faint-hearted, as he'll have a fifty mile commute to the museum, and plans to carry out the work on a one-day-per-week basis.